On the night of Tuesday, July 31, Karen Tunmore walked up to the front desk of Northumbria Police’s headquarters and said she had a confession to make. After 14 years of keeping her dark secret almost to herself, the 36-year-old children’s football coach could hide it no longer. Today, Tunmore was beginning a life sentence for the murder. What triggered her decision to reveal her responsibility for his murder is still not known, but the friend she confided in told her the only way she could clear her conscience was to come clean. In a distressed state, Tunmore was driven to the force’s station in Middle Engine Lane in Wallsend, just a short distance from her own home, and told Northumbria Police that she had armed herself with a baseball bat and attacked as the “red mist” descended on the night of Wednesday, January 7, 2004. Detective Chief Inspector John Bent, who has headed up the inquiry, said: “She walks into the police station and says she want to make a confession at that time. The duty inspector who was on rang me at home and it was one of those ‘really?’ moments. “The duty inspector who was on rang me at home and it was one of those ‘really?’ moments. “It’s not unheard of nationally, but for me, in 22 or 23 years of working in this job, someone confessing their remorse so long after the event, it’s very unusual. “She has made this disclosure to her friend and they have subsequently driven her here. “She is known to police, but not for anything significant and her background is football coaching, and she was never a feature at all in our original inquiries. The only motive detectives can see is financial - for the sake of a few hundred pounds Scott owed to the man in Tunmore’s company that night - as she made plans to sell her mate the car. Det Ch Insp Bent said: “She has taken a baseball bat which is often in her car and has said she was particularly violent in drink at the time of this assault took place. Detective Chief Inspector John Bent, who led inquiries following Tunmore's confession. 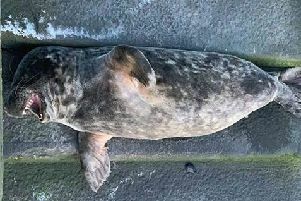 It said the bat, thrown in to the footwell of the car, was later dumped in the water off the North Shields’ fish quay, while the mats were dumped in long grass nearby - it is thought ones found by police on the same spot of land are those in question, although no forensic evidence could be found. The team then began to work through the files as the pieced together information, while Ian Sharp, who was the Detective Superintendent in the case when Scott died, returned to the force to read through the documents to help, with evidence including CCTV kept on VHS reviewed a fresh. On Friday, August 3, police confirmed they had charged Tunmore - also known for being involved in other sports including boxing - with Scott’s murder. Mr Sharp retired a year after the killing and it remained his only unsolved case. He was at Newcastle Crown Court to see Tunmore face her fate. Northumbria Police Force Headquarters in Wallsend, where Karen Tunmore made her confession 14 years after she killed Scott Pritchard. Some 14 years on, the case had remained open and periodically reviewed, with the hunt now on to find the man who helped Tunmore on that night and helped keep her secret for so long.